In Savannah, houses, buildings, and lush landscapes of all periods blend uniquely together, as in this view of Chippewa Square. The core of Savannah, Georgia—a National Historic Landmark since 1966—is a series of wards, or neighborhoods, each wrapped around a park-like square and connected by arrow-straight streets with median strips resembling linear forests. The squares calm the relentless traffic in the bustling city center, while the border streets speed it toward farther destinations. Within the squares, live oak trees wave banners of Spanish moss, creating large patches of dark-velvet shade punctuated by shafts of sunlight. Benches and sculpture invite contemplation; generous brick walkways encourage strolling. The squares are orderly but populous—with the briefcase crowd, the homeless, toddlers and nannies, plaid-skirted schoolgirls, portfolio-juggling art students (the Savannah College of Art and Design occupies many of the city’s historic buildings), the occasional camouflage-clad soldier, and, of course, tourists. The soul of historic Savannah is this artful network of wooded squares and avenues, laid out by James Edward Oglethorpe when he led the first small band of settlers—mostly refugees from British debtors’ prisons—to a barren, sandy bluff above the Savannah River in 1733. 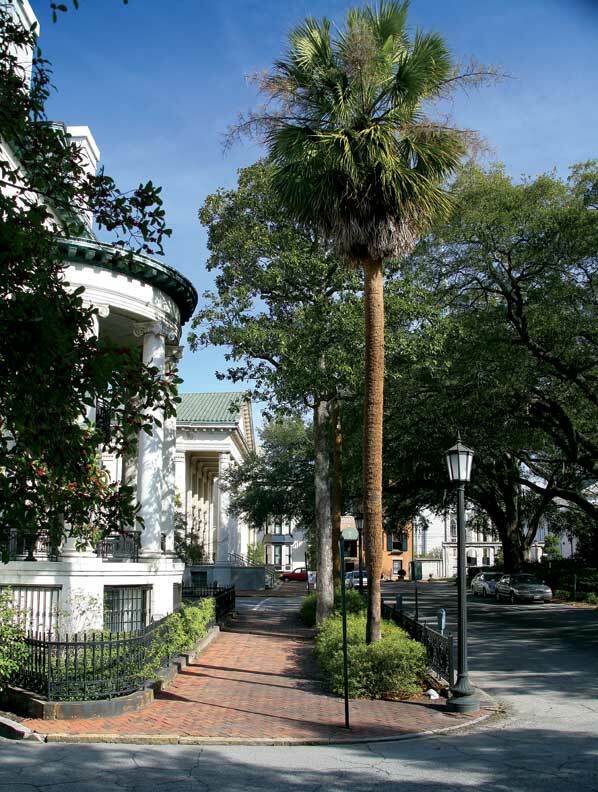 And Old Savannah’s face is the timeless Federal-style architecture surrounding the squares. 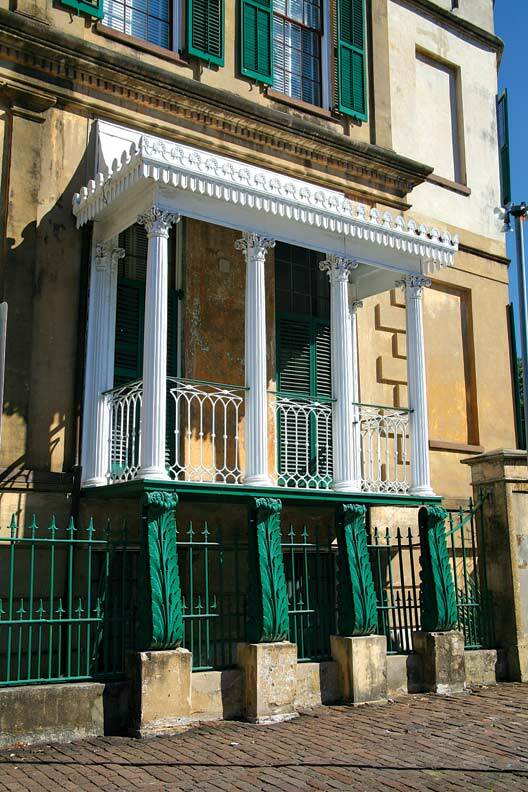 The dramatic Regency side porch of the Owens-Thomas House, 1818, displays a a wealth of neoclassical detail that’s raised on four cast-iron console-like posts imported from England. These buildings demand equal attention from Savannah sightseers. Oglethorpe divided the land around the squares into “Trust Lots” (his term for plots reserved for public buildings) and “Tythings” (where citizens’ houses were to be built)—distinctions that blurred as the city grew. Historic Savannah today is mostly houses—and a great many of them are Federal-style houses, even if they were built beyond the Federal period. Fires in the late 18th and early 19th centuries destroyed much of Savannah’s early building stock, and wars (the French and Indian War, the Revolutionary War, the War of 1812) dampened or delayed rebuilding efforts. Peace returned and prosperity increased in the 19th century. By then Savannah, a thriving seaport for exporting cotton, was ready for bigger and better buildings. 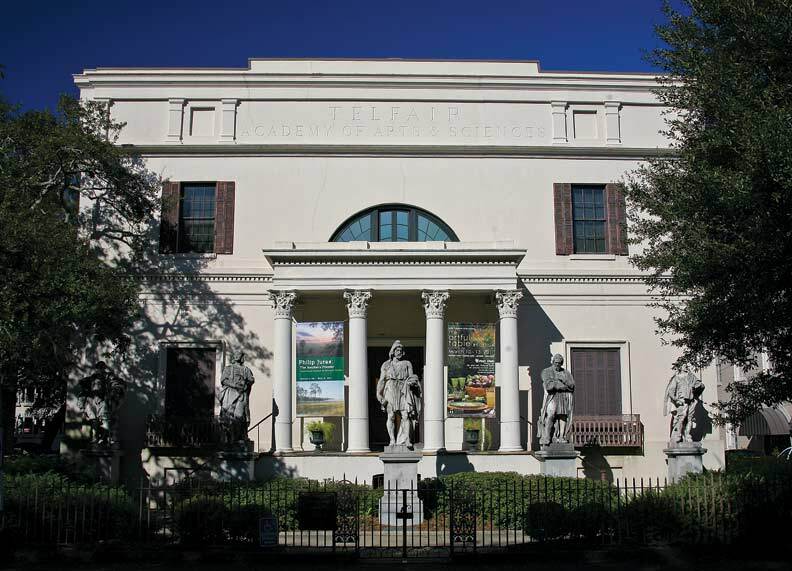 The 1816 arrival of William Jay (1792-1837), a 24-year-old British-born and -trained architect, brought a burst of stylish neoclassical exuberance to Savannah’s rather subdued architectural scene. A student of the Regency style (named for King-to-be George IV, who was Prince Regent from 1811 to 1820, during the style’s heyday), Jay gave Savannah several glorious Regency-style buildings. All are now museums. The 1818 Telfair House, a Regency masterwork by architect William Jay, has for many years been used as an art museum. They include the Owens-Thomas House, built in 1818; the Telfair House (1818-1819), now the Telfair Museum, which was renovated to add a sculpture gallery and a rotunda before becoming the Telfair Academy of Arts and Sciences in 1886; Scarborough House (1819), now the Ships and the Sea Maritime Museum; and the 1821 Wayne-Gordon House, now the Juliette Gordon Low Girl Scout National Center, which, like a number of Savannah’s two-story Federal-era houses, gained an additional story during the Victorian period. Arched, leaded fanlights distinguish this pair of brick Federal houses, while the doors have later Victorian arched panels. English Regency buildings were undeniably beautiful and impressive, but the style didn’t always suit America’s (and particularly Georgia’s) more conservative tastes and pocketbooks. The less-grandiose Federal style was more appealing to the new republic. 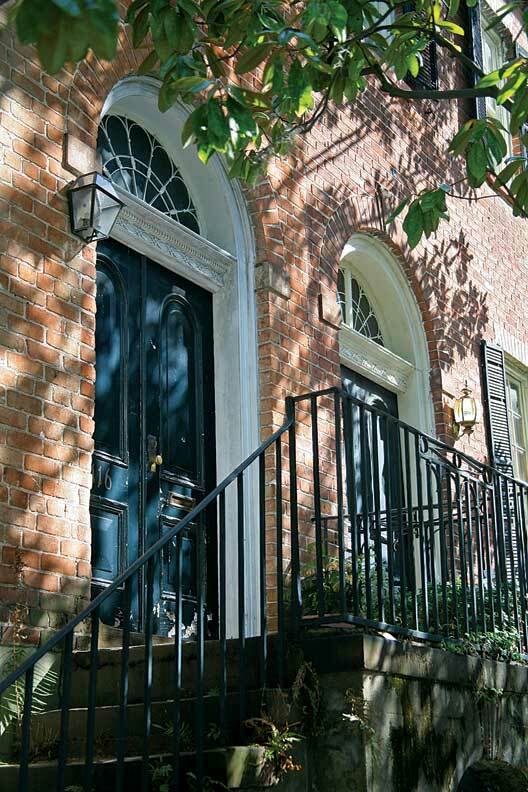 Cast-iron balconies, railings, and columns enrich the fronts and sides of many otherwise unassuming Federal-style houses, as well as those of English Regency design. 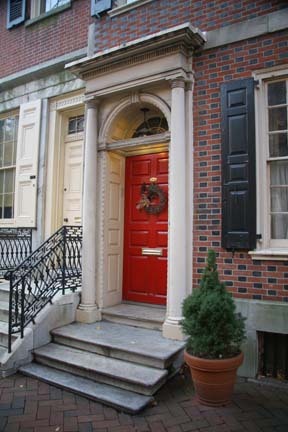 Some of the ironwork on William Jay’s houses is thought to have been imported from England, but much was probably made in America. It’s impossible to overlook the lengthy exterior stairs leading to and from front doors: not straight up and down, but veering to one side—or both. 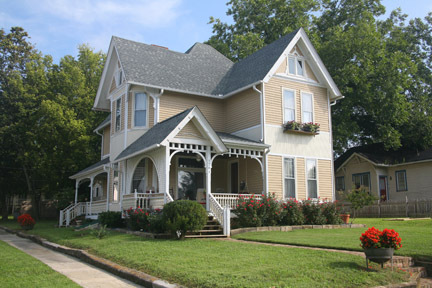 Sometimes, in double houses, the steps to the two entrances nearly meet, like good neighbors, at the bottom. Extended stairs were necessary because basements are almost invariably high—generally a full story—perhaps as a concession to the area’s high water table or to garner space for service areas. One of the best Federal frame houses, raised on a full basement, is the circa-1820 Francis Stone House. The staircase and entry porch show a main living floor on the upper level. 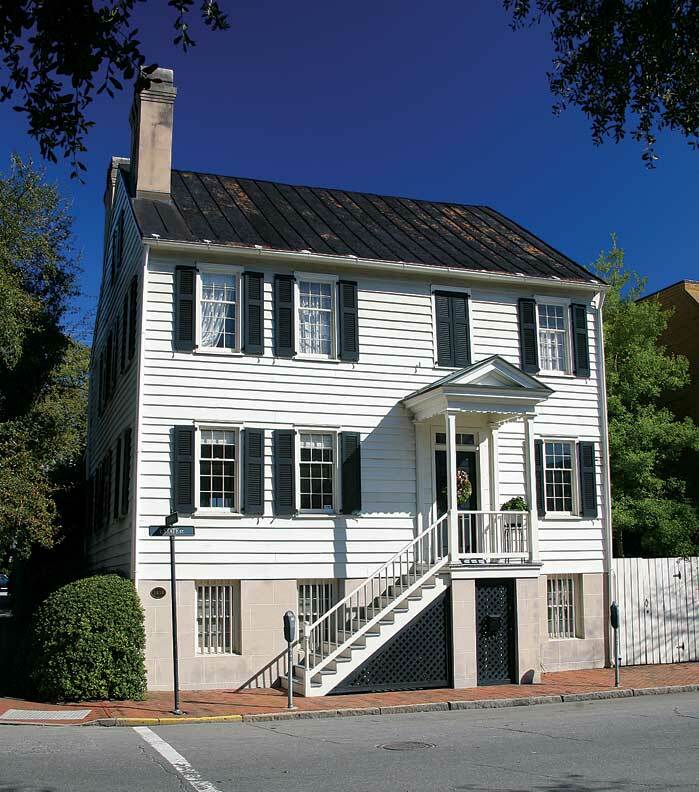 The prevalence of extant Federal-style frame buildings is striking because, in dense urban areas such as Old Savannah, they were usually banned as fire hazards. Whether the house is of frame, brick, or stuccoed tabby, however, the raised basements are always masonry. Exposed bricks are often the large, soft, locally produced, and much sought-after “Savannah Greys,” with distinctive mottled surfaces. Row houses became fashionable here during the Federal period, and they continued to be built—often still in the Federal style—well into the post-Civil War period. Savannah’s long, unbroken ranges of uniformly designed row houses are unique in the South. And here’s something to think upon: Savannah, conceived as a last-chance haven for down-and-out Britons, designed by a man who could never have imagined an automobile, and built on what an early visitor called “a pile of sand,” is today a lush, driveable city that makes modern visitors of any nationality feel rich as royalty. 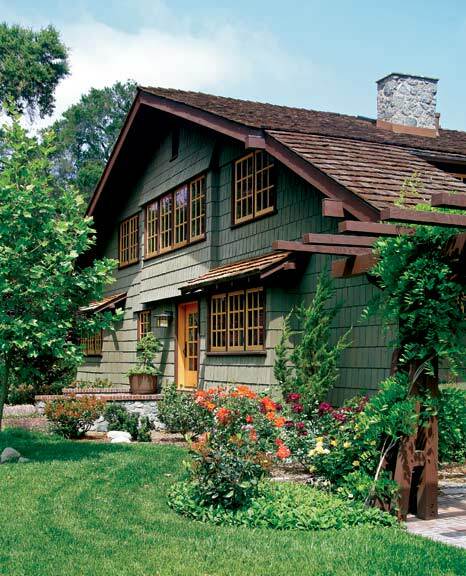 A wave of early 20th-century development left the college town of Claremont, California, with a pleasing assortment of period eclectic architecture.